The porous edges of an MDF panel or the end grain of boards need to be sealed thoroughly or they'll look and feel rough. Just brush on a sealer, such as white pigmented shellac, and sand after 45 minutes or so. Repeat until edge feels smooth. Pine knots will stubbornly bleed through regular paint no matter how many coats you apply. To hide them, seal the wood first with a shellac-based sealer. The best start for any painted wood surface is to seal and prime it first. White-pigmented shellac, such as B-l-N, is one of the most convenient products to use for a sealer. B-l-N is available at most home centers and paint stores. You can use a brush, roller or spray gun to apply the sealer. It dries in about 45 minutes, so you can apply numerous coats in one day. Sealers are designed to sand easily and leave a smooth foundation for the paint. Sealing knotty pine before painting is a must. That's because the resins in pine, which are used to make turpentine, will bleed through even an oil based paint. The problem is especially noticeable around knots and pitch pockets where sap concentrates. Shellac is unequaled at sealing knots in pine so the resins will never bleed through the painted surface (Photo 1). If you're painting a new project, sand the wood and scrub it with a rag saturated with naphtha to remove some of the resin first. Then load up your paintbrush and seal the ends of every board and spot prime over knots and sap streaks. Let the primer dry. then apply at least two coats of sealer over the entire project. Apply two sealer coats before topcoating with paint and three sealer coats before topcoating with lacquer. An extra coat on the end grain of boards and on the edges of man made material like MDF (Photo 2) helps to fill these rough areas. Let the sealer dry, then sand and apply the topcoat. If you're repainting a project where the knots and sap streaks are bleeding through, you can still seal in the resins. Make sure the paint is completely dry, then sand and prime the problem areas with the shellac-based sealer. Once it's dry, sand and apply a finish coat of paint. 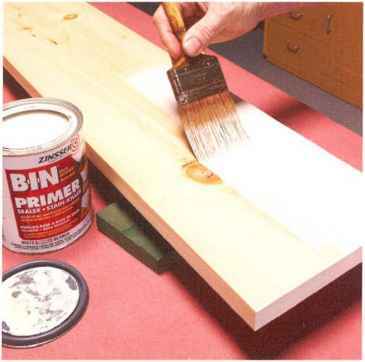 Stop pine knot bleed through with a shellac based primer. 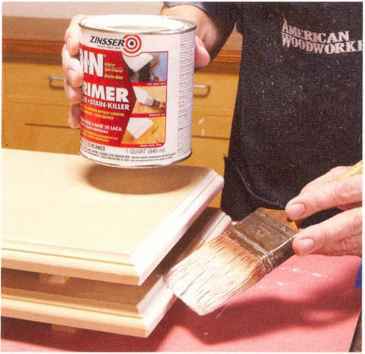 Make inexpensive plywood look like solid wood by filling voids and end grain with exterior spackling compound. Let the spackling compound dry for half an hour, round over the edges of the plywood with a router bit or sandpaper and sand the edge smooth. Brush on a primer and top coat and you've made economical materials look classy. Spread a thin coat of spackling compound onto the edges and sand smooth before painting. Spot-fill any defects on the face of the MDF as well.The result will be ultra-smooth edges and faces on painted MDF. Sources 3M SandBlaster sanding sponges. Dap Dry Dex spackling compound, Zinsser BIN Primer Sealer and Rust-Oleum Painter's Touch gloss are all available at most home centers and hardware stores. 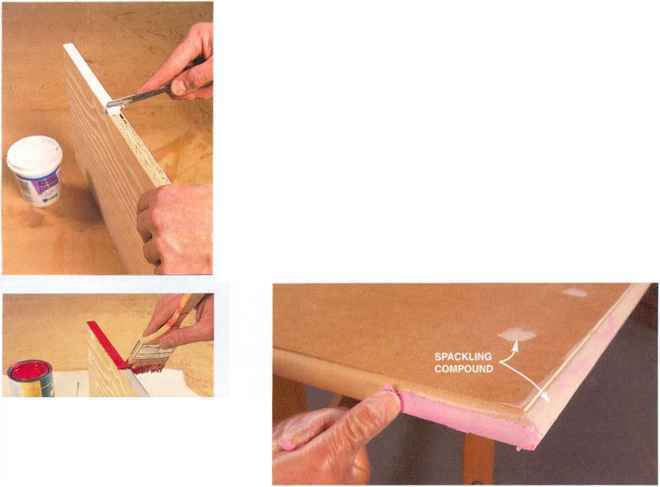 Here's the trick to make the rough edges on man-made material such as MDF, parti-cleboard and plywood as smooth as the surface. Simply coat the edges with spackling compound before priming. First, sand the raw edges with 150-or 180-grit paper. Sanding sponges are ideal for this job. They're stiff enough to get into corners but soft enough to conform to a rounded edge. Use a putty knife or your fingers to apply the spackling compound on the edges and to fill any surface defects (see photos below and left). Dap Dry Dex is a spackling compound that goes on pink then turns white when it's ready to be sanded. Sand the spackled edge with the 180-grit sponge. It's okay if you sand down to the wood a bit. The spackling compound does not have to completely coat the edge; it just has to fill in the pits. Before you paint, seal the whole piece with a couple coats of high-quality primer sealer such as Zinsser BIN, a shellac-based primer that dries super-fast and sands beautifully. Switch to 220-grit paper to sand the primer. Finally, spray on several coats of color enamel paint. Be sure to lightly sand between coats. The result will be a stunning, glass-smooth surface. How to stop pine knots from bleeding through paint? How to stop pine knot from bleeding through paint? How many coats of shellac to seal wood knots? How do you seal paint on smooth surface? How to fill in rough edge wood paint? How do you seal knots that are bleeding through the paint? How to stop pine bleed? How to seal MDF edges before painting? How to sand pine smooth before painting? How to seal pine knots on boards? How to fill in knots in pine wood? HOW TO SEAL KNOTS IN PINE PAINT? How do i seal mdf edge before painting? How to seal end grain of wood for painting? What do you use when the sap of the boards bleeds through the paint? How do you stop the resin or oil bleeding through paint out of the knots in pine? How to block pine knots from bleeding through paint? 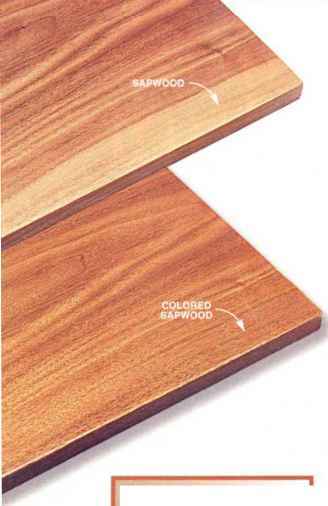 How to use wood filler or putty on plywood edge? Can you use turpentine to stop knots from bleeding through paint? How do you prepare end grain for painting of pine? How do you hide woodgrain in fingerjoint pine shelves with paint? How do you stop birch plywood from bleeding through paint? How to seal knots in wood before painting? How to use slackling compound to fill in grain before painting oak doors tutiorals? How to fill in plywood grain? How to fill plywood end grain for painting? How to paint seal pine wood? How to disguise the grain of plywood? 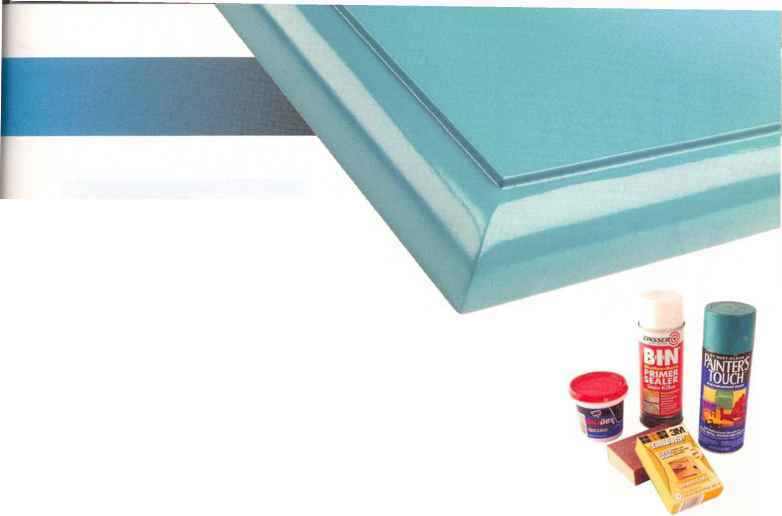 How paint white laminated mdf rough edges? How to prevent bleeding when painting onto plywood? How to cover the pinewood edges? Do birch knots blled through paint? How to paint the raw edges on laminated furniture? How to framing the laminating mdf edge? How do you seal painted wood carving? 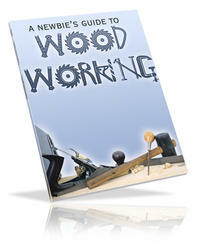 Can you paint an edged wood? How to smooth wood edges for painting? How to apply shellac to mdf? How to paint porous wood? When sealing with shellac does it need to be roughed up before being painted? How to fill plywood knots before painting? How to paint end grain? How to cover end grain? How to make painting end grain of wood easier?